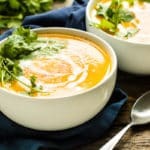 Enjoy a big bowl of roasted butternut squash soup that is made with coconut milk and other Whole 30, vegan, and Paleo-friendly ingredients. This vegan butternut squash soup makes a wonderful main dish, appetizer, or side dish recipe. 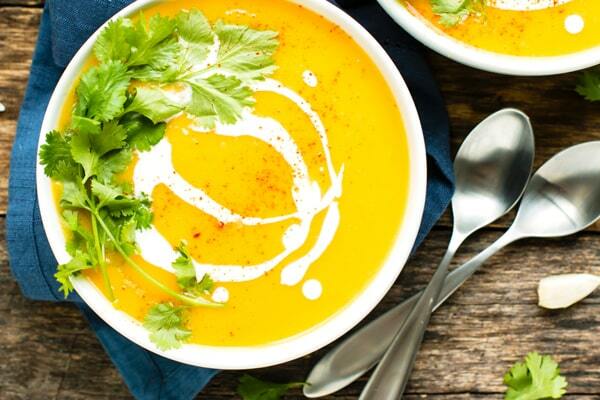 Want more vegan soup recipes like this butternut squash soup? 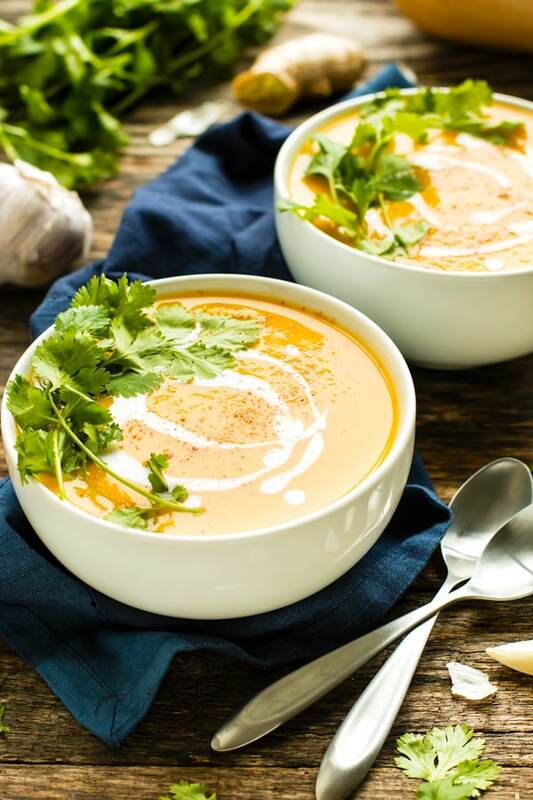 This Healthy Cauliflower Soup, Cream of Asparagus Soup, and Roasted Tomato Basil Soup are a few of our favorite healthy and creamy soup recipes! Even right now as I type these words, I am craving a bowl of this nutritious roasted butternut squash soup. For some reason, my body decided to trick me last week and it felt like I was coming down with a cold. I got the usual tickle in my throat, extreme fatigue for a day, a slight cough, and then…. nothing. Jump forward exactly a week later and I feel like my head is about to explode from all of the pressure that my congestion is causing. My poor husband probably tossed and turned as much as I did last night as we repeatedly awoke to the sound of my violent cough throughout the night. Is anyone else out there dealing with a cold, too, right now?! While getting a cold is not the end of the world, it certainly does make you appreciate the majority of days that you are healthy. Can this Roasted Butternut Squash Soup Help Fight a Cold? Normally I am diligent with dosing up on Vitamin C at the first signs of coming down with a cold. And guess what… a bowl of this Paleo butternut squash soup has over 50% of the recommended Vitamin C that you need! Not to mention, this roasted butternut squash soup is full of fresh ginger, garlic, and cinnamon. Ginger: it is anti-inflammatory and will help ease a sore throat. It also has the potential to kill rhinovirus before it rears its’ ugly head! Garlic: has special components, Allicin and Allion, which contain antiviral and antibacterial properties. Cinnamon: contains anti-inflammatory and immunity-boosting properties. Not Convinced of this Paleo Butternut Squash Recipe Yet? Even if you are not coming down with a cold, or know someone who is, this roasted butternut squash soup still tastes absolutely incredible. You just might feel like you have been transported to the most elegant log cabin in the wintry mountains when you are enjoying a bowl of this soup! <– Can you tell I am a dreamer?! How Can You Evolve this Butternut Squash Soup with Coconut Milk? Add a bit more garlic, ginger, and cinnamon to boost your antioxidant levels. 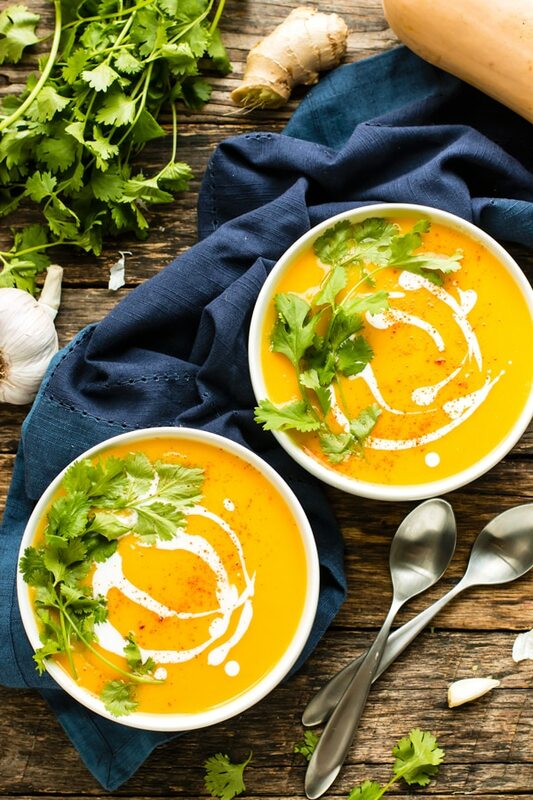 Want more recipes likes this Roasted Butternut Squash Soup? 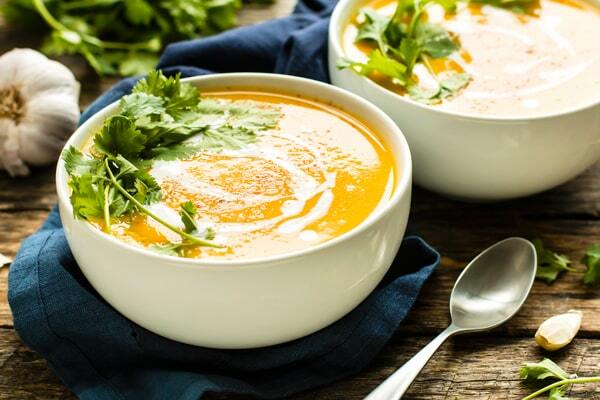 Enjoy a big bowl of roasted butternut squash soup that is made with coconut milk and other Whole 30, vegan, and Paleo-friendly ingredients. It makes a wonderful main dish, appetizer, or side dish recipe. Drizzle 1 tablespoon olive oil and sprinkle a pinch of salt on the inside of both halves of the butternut squash. 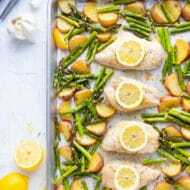 Place squash face-down on a large baking sheet lined with parchment paper or aluminum foil. Bake in preheated oven for 50-60 minutes, or until squash is tender. In a medium skillet combine 2 tablespoons olive oil and onion. Sauté over medium heat for 5 minutes. Add garlic and ginger. Continue cooking over medium heat for 2 minutes. Lastly, add salt, cayenne, cinnamon, coconut milk, and broth. Stir to combine ingredients. Cover skillet with a lid, reduce heat to low, and let ingredients simmer for 5 minutes. Once squash is done cooking, remove as much flesh as you can and discard the skin. Add half of the squash and half of the coconut milk mixture to the bowl of a large food processor. Process for 2-3 minutes, or until contents are completely smooth. Pour soup into a large pot over low heat. Repeat above step with the remaining squash and coconut milk mixture. Stir ingredients in the pot to ensure even mixing. Serve soup immediately with a drizzle of coconut milk and fresh cilantro. Enjoy! See this recipe in Healthy Meal Plan #3. *You can use Lite coconut milk instead of full-fat, but be sure to only use 1 cup of broth initially. **Feel free to use chicken broth instead of vegetable broth if you are not vegan. Wow! Just made this butternut squash soup. I couldn’t believe how easy and delicious it was. This one is a definite keeper! Yay, Debra!! So happy you enjoyed it 🙂 Thanks so much for the comment! Hi… I am looking to fill up a 5.5qt crock pot with this soup, for an Ash Wednesday soup supper. Do you have recommendations for increasing the volume, and using ground ginger instead of fresh? Thanks! Hi Kathy! This soup sounds perfect for an Ash Wednesday soup supper! You should be OK with doubling the recipe. The recipe makes about 7-8 cups of soup, so you should be safe serving it in a 5.5 quart Crock Pot (which will hold 22 cups when filled to the brim!) As for ground ginger instead of fresh, I would start with 1/4 teaspoon and then add up to 1/2 teaspoon if you want a little more ginger flavor. Thanks so much for your questions! I made this for a vegetarian friend who is under the weather. I didn’t have any fresh garlic, and added garlic powder with the other spices. It came out beautifully, and was very tasty! I will surely make this again! I love that you worked with what you had on hand, Margaret! And I am so happy that your friend enjoyed the soup. I hope she gets to feeling better soon! Thanks so much for your comment and rating! I am so happy you enjoyed it, Sheryl! Thanks so much for your review! So happy you enjoyed it, Crissy! Thank you for this wonderful recipe. I just had my wisdom teeth removed AND am on day 15 of the whole30. This soup has been a savior for me – it’s so delicious and flavorful. You’re so very welcome, Mary!! I’m happy this soup could help get you through your week. My hubby and I are dentists so I know how uncomfortable it can be after that surgery. Thanks for your comment and rating!! Needs nutmeg; makes it much better! OMG this is sooo good! Rich, flavourful, smooth and creamy! what more could you ask for? Yay, Kathryn!! I just made this again last night, too! Thanks so much for reminding me of how creamy it is 🙂 And thank you for the comment and rating!! I only discovered butternut squash this year and I was looking online to see what all you xan do with it. This soup is so amazing!!! I made it by the recipe and added just a bit of nutmeg. This is such a warm, comforting and satisfying meal with the aromatics and the creamy texture. I’m so glad I picked this recipe. Thank you!!! Just made this. It tastes delicious, and the kitchen smells so wonderful. I don’t have any cayenne, but I subbed half of the cinnamon for some Garam Masala to add depth, plus I upped the amount of the spices (not sure by how much). Also, my butternut squash was pretty small, so I added some pureed Winter Luxury pumpkin I had left over from making pies. They’re great for soups and pies. I used Better Than Bullion chicken broth, too, as I don’t have any vegetable broth on hand. I also omitted the onion, because I don’t have one today. So just so everyone knows, this recipe is adaptable and delicious! Not to mention easy and quick once your squash is roasted. Oh I just love all of your additions and changes, Stephanie!! It sounds like it turned out incredible. I’ll have to try some of these out next time. Thank you so much for your kind comment and rating!! Just made this tonight! It was creamy and delicious! I had this thick, uncuous, tastiest of soups in a restaurant in Scotland last weekend and asked the chef to let me know his secret–he wouldnt tell me anything except that it had coconut milk with the butternut squash so I have worked out that it was this recipe! My carnivorous daughter, who would never choose a soup, had the venison, then, after a try of MY choice wanted to swap meals!! NO WAY– I love this adaptable, make-it-a-meal, bowl of loveliness. Wow, Jenny!! I am so happy this recipe was what you were looking for!! Now your daughter can have as much as she wants 😉 Thanks so much for your kind comment and rating!! This soup is AMAZING. I had to modify it a bit, as I can’t eat onion or garlic due to SIBO, so subbed the green parts of green onion for the onion, eliminated the garlic cloves, and used garlic-infused olive oil (SIBO legal) when roasting the squash. It was absolutely incredible. So, SO good. I often find butternut squash soup to be a bit too sweet for my liking, but this was just the perfect balance. Immediately added to our weekly rotation. Thanks so much!!! I made this, I have never eaten butternut squash but wanted to make this. I had a can of coconut milk in the pantry. It turned out so delicious, 5 star delish!!! I used an immersion blender, perfection!! Would you be able to use an immersion blender right in the big pot to mix? Hi Sara! Yes! An immersion blender will work great, too. Thanks for the question! My entire family loved this recipe! The first time I made it, their interest level was low because of the spicy cayanne. The second time I omitted the cayanne, and my family couldn’t eat it fast enough! So good. My son has a dairy allergy so we’re always trying to find things to include him in our good eating. Will make again. I saw that it’s 302 cal. Is that a serving size of one cup? Just checking. Thanks. Hi Kate! I’m so glad your son is able to enjoy it. Many of the newer recipes on the site are GF and DF, so hopefully you will be able to find more he will love, too! As far as serving size, yes, it is roughly 1 cup, but depends on how large your butternut squash is. Thanks for asking and for your comment/rating! Hi London, can you make this and freeze it in advance of a dinner two days later? Hi Charles! Great question. You absolutely can prep this ahead of time and reheat it the day of serving. I would suggest just refrigerating it since it is only 48 hours. Reheat it in a covered pot over medium-low heat for best results! I don’t usually leave comments but this was so easy and delicious, especially if you have an immersion blender!! Here are the adjustments I made: Use 2 bags frozen cut squash roasted. 2 C bone broth. 1/8 t nutmeg. 1 piece bacon puréed in soup and a spoon of bacon grease. Add s+p to taste. Top with bacon crumbles. Next time I will make more to freeze! Thanks! Hi Amanda! I absolutely love your adjustments. I bet it tasted amazing with those bacon crumbles. Will have to try it out next time. Thanks for your comment and rating! This recipe is AMAZING! Honestly I was skeptical that it would taste very good, but I was proven to be very wrong. It is DELICIOUS! Yay, Nicole!! I am so happy you enjoyed it so much. Thanks for your comment and rating!! I babyfied it — used a tiny pinch of cayenne pepper, left out the salt, used a low salt stock cube, then fed it to my one year old who couldn’t get enough of it! And I thought it was delicious as well! Nice recipe! And great for growing kids. Yay, Sid!! Absolutely LOVE your “babyfying” changes. It’s always a win-win when the kiddos love it as much as we do. Thanks for your comment and rating!